I’ve been reading a book entitled Lost in Translation recently. 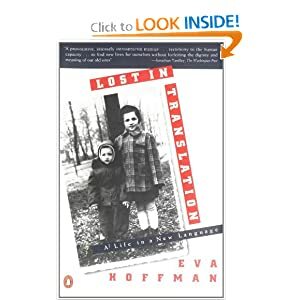 The book is the memoir of Eva Hoffman who emigrated from Poland to Canada when she was around 12 or 13. Eva spends a good part of the book contemplating who she is, which self she is, and in which language she lives and functions. In the position that I am right now, I have found this book fascinating, and it has highlighted some things that I know I have experienced, but maybe haven’t been able to articulate. I actually walked and talked with God a bit about this book today. It’s easy to read this book and become slightly pessimistic about where I am and if I’ll ever fit in. It makes me wonder if I’ll ever be able to speak the language fluently, or understand why people here do what they do. It was comforting to pray through these issues and remember that, ultimately, my citizenship isn’t in this world anyway. It doesn’t really matter if I fully assimilate, because I’m not meant to. I’m meant to live here, and take full advantage of the life that God has given to me, but if I remain the one who can’t quite fit in, or can’t quite understand the nuances of what is going on around me, it’s going to be okay. I have something more fulfilling and more satisfying waiting for me. I will not drown in pessimism when there is abundant glory promised to me. Here is a snippet of a particularly thought-provoking passage in the book. May I use this one life to the fullest!